©W.L. Wagner. Courtesy of Smithsonian Institution, Dept. of Systematic Biology, Botany. Usage Guidelines. 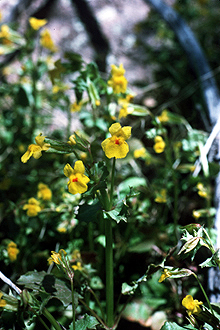 Mimulus guttatus is a colonizer of wet sunny habitats, although it tolerates partial shade. Store in a cool dry location in paper bags. Direct sowing onto the site is the most successful method. Established plants will self-sow. 6. Guard, B. Jennifer. Wetland Plants of Oregon and Washington. Lone Pine Publishing. Vancouver, B.C. 1995.